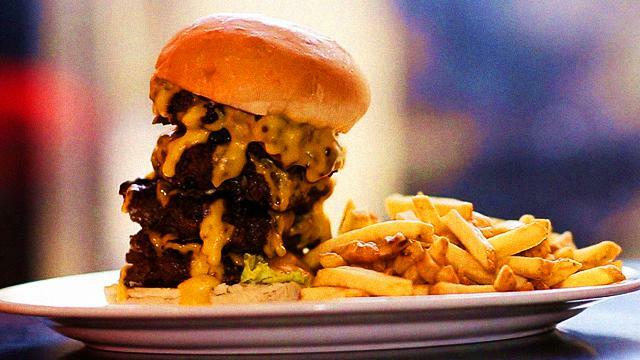 Can you take on their four-patty monstrosity, the Tombstone Burger? Everyone loves beef patties and melted cheese sandwiched between a sesame seed bun. But don't restrict yourself to the same old burger you order at fast food chains. In this first episode of FHM Is Hungry, we visited Zark's Burger in Taft Avenue, Manila. The restaurant is a great place to be when you're craving, well, burgers. Their roster of burgers is divided into two categories: Minor League and Major League. The Minor League has regular-sized burgers dressed up with various toppings like spam, mushroom, fried chicken skin, and bacon. On the other hand, the Major League features one- to two-pound burgers, with slices of spam, bacon, or overflowing cheese sauce on top. We don't want to make you drool with photos alone so we went straight to Zark's kitchen to come up with a video showing what goes into the chain's beefy creations. You can visit Zark's Burger in the following branches: Taft, Katipunan, BF Homes, Eastwood, Mckinley, SM North, SM Fairview, Southmall, SM Bacoor, Araneta Center, SM Sta Mesa, SM Manila, Megamall, SM Iloilo. For more information, message them on their Facebook page.